Safety signs to go up at construction sites in B.C. 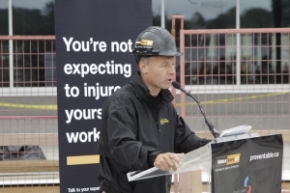 WorkSafeBC has joined forces with The Community Against Preventable Injuries and employers in British Columbia to develop and distribute workplace signs throughout construction sites across the province to remind workers and employers about workplace safety, WorkSafeBC reports. When it comes to the importance of injury prevention in construction, the word is out. And soon that word will be hard to miss, thanks to a new joint project to set up workplace signs reminding construction workers and employers to stay safe at work. The project, a combined effort between WorkSafeBC, The Community Against Preventable Injuries (Preventable) and employers is being unveiled today at BCIT’s Broadway Tech Centre #4 construction site in Vancouver. Construction is a high-risk industry. In 2010, 14,405 WorkSafeBC claims came from construction worksites across B.C. Thirty-two of those injuries led to worker deaths — 19 due to occupational disease — representing the highest number of work-related fatalities in any industry sector in the province. Stuart Olson Dominion’s Broadway Tech Centre #4 construction site joins a total of eight pilot sites involved with the construction safety sign campaign. Five are in the Lower Mainland, and the others are in Esquimalt, Kamloops and Prince George. The other employers are ITC Construction Group, Kindred Construction Ltd., Lafarge Aggregate & Concrete, and PCL Construction. Preventable is a registered, non-profit organization governed by a board of directors consisting of representatives from such organizations as TELUS, the BCAA Traffic Safety Foundation, the B.C. Injury Research and Prevention Unit, the Insurance Bureau of Canada, London Drugs, WorkSafeBC, Pacific Blue Cross and the B.C. Ministry of Labour, Citizens’ Services and Open Government. Preventable is province-wide, and works toward injury prevention as a whole: raising awareness, transforming societal attitudes, and ultimately, changing behaviours. The goal of this organization and its partners is to significantly reduce the number and severity of preventable injuries in B.C. WorkSafeBC is an independent, provincial statutory agency governed by a board of directors that serves about 2.3 million workers and more than 200,000 employers. WorkSafeBC was born from the historic compromise between B.C.’s workers and employers in 1917, where workers gave up the right to sue their employers and fellow workers for injuries on the job in return for a no-fault insurance program fully paid for by employers. WorkSafeBC is committed to safe and healthy workplaces and to providing return-to-work rehabilitation and legislated compensation benefits.